I could have titled this post, "This is why you need a good zoom lens". Because if you really want to capture what your kiddos are up to and you're 7 months pregnant and sitting on the deck sipping lemonade and wondering how on earth you're gonna make it to your delivery date and have no intention whatsoever of moving from the current spot you're in no matter how numb your booty gets, then you need a good zoom lens. If you use a point and shoot camera, then I can't stress enough how making the investment into a Digital SLR will change what kinds of pictures you can take. YES, it's expensive - but it's worth every penny, and worth saving for! SO, with my zoom lens in hand, this is how it went down across the lawn last Saturday. "NO, NO, Lincoln. This isn't for babies." 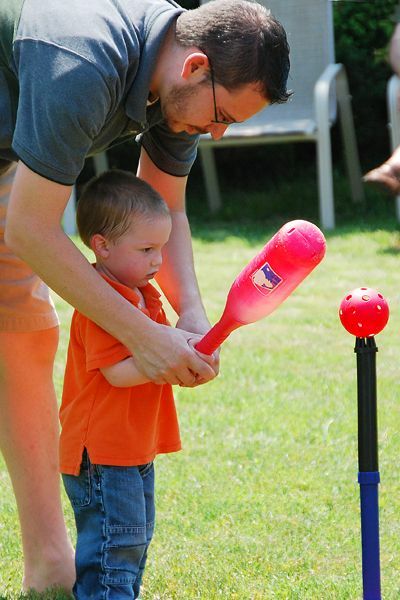 Having successfully gotten his revenge, Lincoln found the one person on earth who would never tell him his cousin's new t-ball set wasn't for babies. The person he trusts more than even his Momma. And, he listened and learned. A few moments later, or more appropriately, a few glasses of lemonade later, my baby set out to prove that he, well, BY GOLLY isn't gonna be told he's a baby anymore. With my zoom lens in hand, still sitting in the same spot on the deck I'd been since we arrived, I captured my All-American baby big boy prove to the world that he is, in fact, NOT a baby. Choked up on the bat. Kept his eye on the ball. And, knocked it out of the park. PSHAW! Who you callin' a baby now? Such sweet pictures! And he's not a baby! When did he get so big? I am a lurker who has come out to tell you that he is so cute! oh my - that look on his face is priceless... and a pretty good indication that no one will be bossing him around! Too CUTE!!! He really has grown up so much over the past few months!! We just got a zoom lens with our Christmas money and I agree, I LOVE it!!! We love our zoom lens! I love that look on his face-the one with the "eyebrows". He is too cute! This boy is going places......Watch out! So cute. yay lincoln!! wait until your new little bean is around. lincoln will seem so big and grown-up in comparison.